This item ships for FREE with Super Saver Shipping. See details. Major principles and contemporary themes drive this narrative overview of the field touching on the latest ideas and findings in biological, cognitive, social, developmental, personality, and clinical psychology. 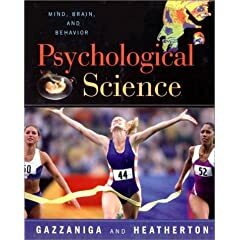 Gazzaniga and Heatherton provide the latest insights on a wide array of topics and issues including the growth of children’s minds, the ways we learn, the impact of serious head injuries on behavior, the reasons why we discriminate against one another, the possibility of changing our personalities, and the causes and treatments of psychological disorders.